← High heels. Love ’em or loathe ’em, you can’t ignore them. Earlier this week, I made a discovery that caused the bibliophile inside me to lose her ever-loving mind. 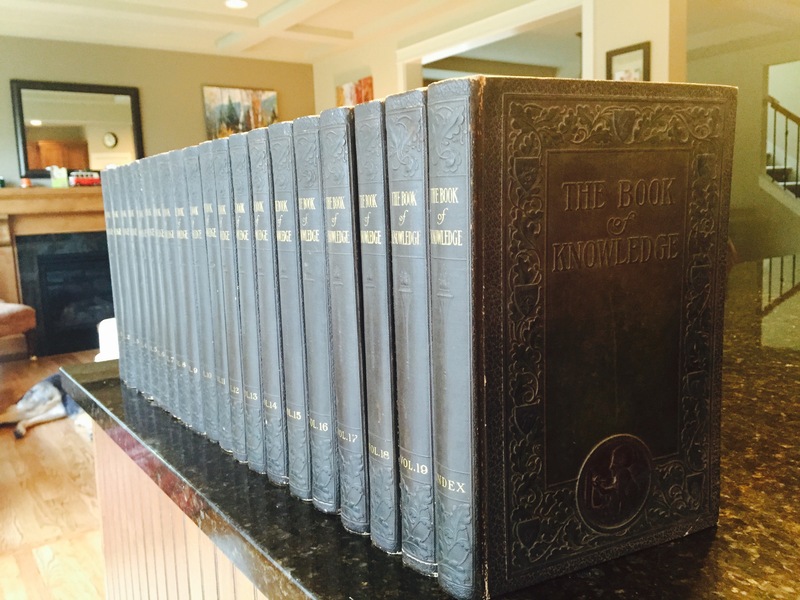 While killing 5 minutes (seriously, I was in and out in under 5 minutes) in Half Price Books, I made a magical find- a complete set of The Book of Knowledge from 1919. I know, right?! You are pumping your fist in the air right now. It’s. THAT. exciting. Try not to hyperventilate. This magnificent set of books attempted to encompass all knowledge as of 1919. 20 volumes. Embossed leather covers. Silky smooth pages. Beautiful illustrations. Stories. History. Poems. Practical advice. Wikipedia, hell- the entire internet, has nothing on these beauties. Finding these gems is the best $100 I have ever spent, hand’s down. These books are amazing. They are magical. They transport you back in time. If you aren’t familiar with them (and I was only slightly)- The Book of Knowledge was a children’s encyclopedia that was published between 1908 – 1964, that sold 800,000 before the mid 1920’s. They were sold, as were many things then, door to door. I can scarcely imagine the excitement and wonder of a child whose parents decided to purchase a set, or even a volume from this series in 1919. In fact, I image it would be akin to Charlie finding the Golden Ticket. Sure, Veruca Salt could demand them, only to have them sit forlorn and ignored on fancy shelves. But I bet there were far more Charlie Buckets’, with parents that carefully pulled money from a savings account or a tin box kept in the pantry and decided to invest in, perhaps even on a payment plan, these portals to a wider world. And a portal they are- now for us, into history. A look at the world as it stood 100 years ago. The sections in each volume reflect the inherent optimism of the editors and attempt to address every question from the philosophical to the practical. This simple “poem” (even the editors were uncertain it hit the bar artistically) remains as relevant today as it was nearly 100 years ago. There are other, less enlightened, things that we can learn from these books too. They remind us of darker periods in world history- when colonization was an accepted practice, and you’ll find no enlightened views on sexuality or gender roles in them. But that’s important for us to remember too. 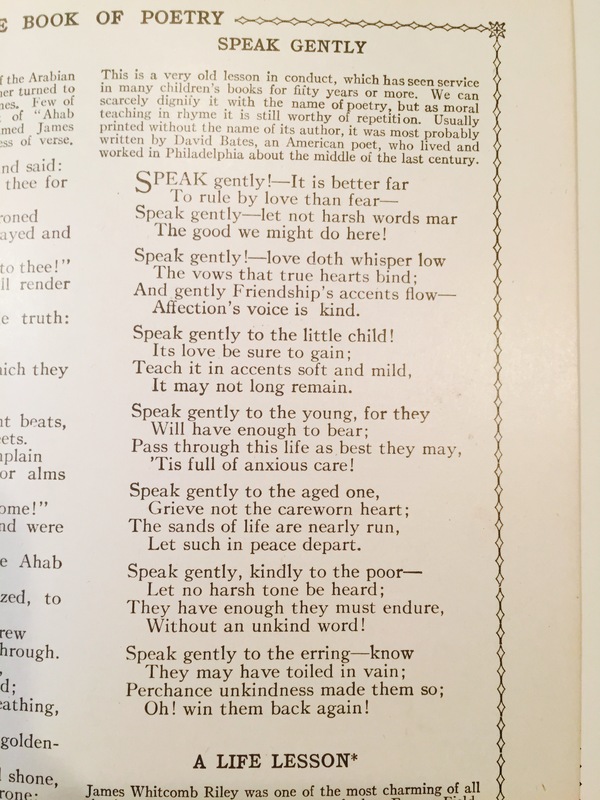 The good advice expressed in the poem, “Speak Gently” remains as true today as it was then. I have always dreamed of having a cabin lined with book shelves. No spot for a TV, just shelves upon shelves lined with books, games, puzzles, and found objects. But really, it’s all about the books. 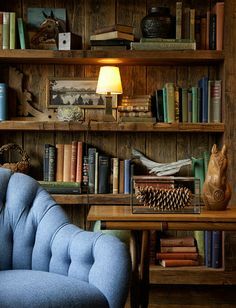 I imagine the kind of floor to ceiling shelves, where you would stand in front of them and be able to just select something at random- maybe a mystery, or an old Stephen King novel, maybe a book of Audubon prints of wild birds, or a gigantic old dictionary- a little bit for every taste. Something to enchant anyone- old, young, cynical or worldy. Books that will delight all the senses- touch, smell, sight (okay- let me amend that, don’t lick the books.) The Book of Knowledge, this 20-volumne set is exactly what I have dreamed would fill those future shelves. Sure, we don’t have the cabin yet- but that’s just a minor detail. Someday, we will. And these books will inhabit a place of honor. If the idea of cozying up here doesn’t make your heart skip a beat, I can’t help you. 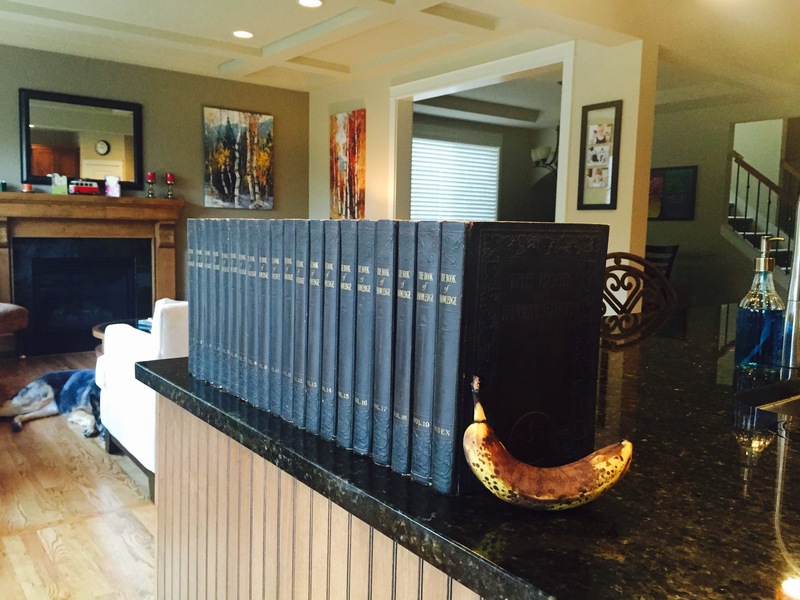 Someday, friends will stand in front of those shelves, grab one of these classic volumes and get lost in the wonder of the world as it was seen through the eyes of a person living in 1919. I recommend you get in good with us now, so you can be on the guest list. Seriously, though- you don’t have to wait. These books are out there! You can find them now. You too can save them and cherish them as our family will. Or, if you don’t want them- send them to me! I’ll give them the loving home they deserve. Not kidding- if you find a book or books that you think would add to this dream, please, please tell me! I recently came across an article about a couple of kindred spirits who are making a similar, though far grander dream come true in Colorado. These books reveal so much more about our past than any Ken Burns documentary ever could (and I LOVE Ken Burns). 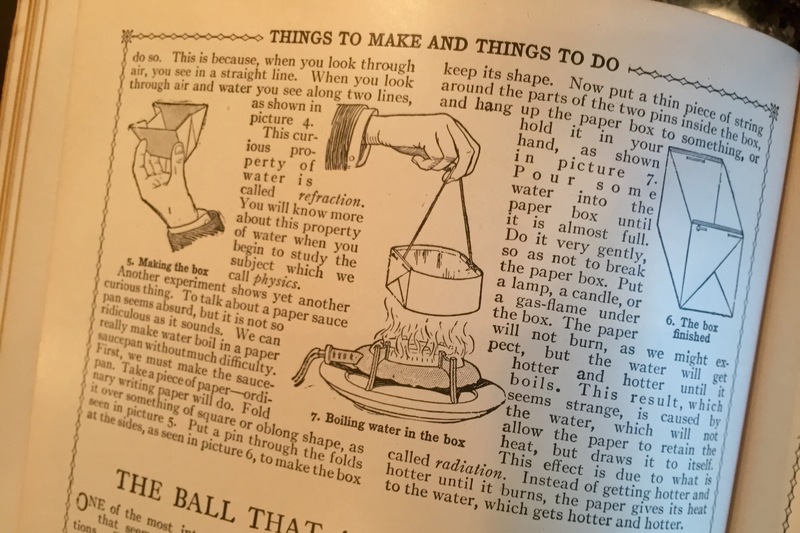 One of my favorite sections is called Things to Make and Things to Do and the suggestions are as various and ingenious as the children they were intended for. Hard to imagine finding this handy bit of info in a book for today’s coddled kids. From making a “handy writing board, to playing “favorite garden games,” to “a cheap way to make an electric battery”- you’ll want to spend the rest of the day relishing in the delight of childlike discovery. I can’t overstate my excitement at finding these books and bringing them into our home as the treasure that they are. I feel lucky to see the magic contained within them and hope that you’ll be inspired to do the same, the next time you see a set of worn covers and yellowed pages. And feel free to reserve a spot at the cabin. Your payment will be your good company but a nice bottle of wine or vintage book wouldn’t hurt! Banana for scale. Obligatory reddit joke. Posted on April 19, 2015, in Big Ideas and tagged 1919, childrens encyclopedia, discovery, door to door, rare books, the book of knowledge, used books, vintage books, wonder. Bookmark the permalink. Leave a comment.